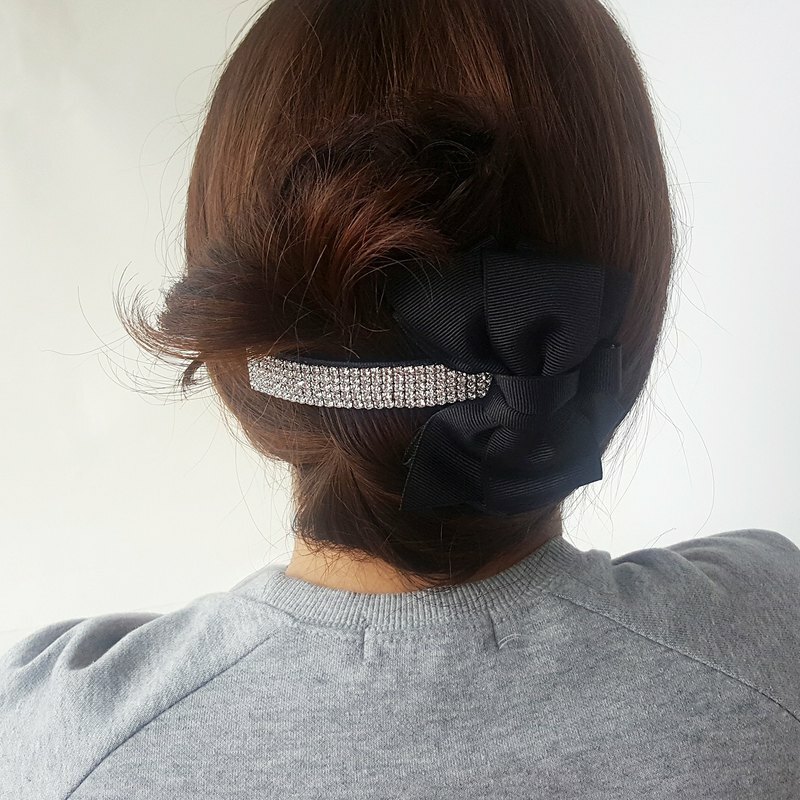 Big ribbon black hairpin Material: rhinestone , black ribbon -------------------------------------------------------------------------------------------------- 1.Big ribbon black hairpin 2.For ponytail, part up. 3.medium size, work for medium to thicker hair 4.The ribbon material is soft and satin 5.Easy to use 6.Great to style hair in a ponytail 7.Can be a nice match for jeans wear or evening dress It's an alternative take on the traditional ponytail and is great for all hair lengths! It makes short hair look longer and shows of the length of long hair! ------------------ [Shipping policies] We ship from South Korea. All items will be shipped out in 1-3 business days after payment has cleared. However, sometimes it could take longer if we have high demands of orders and we will inform you of the delay if occurred. [Shipping] Registered International Air Mail with Tracking Number takes about 7-15 business days or longer to arrive. ( except holidays ) It has tracking number, but due to the nature of registered airmail, the tracking information may not be available for about a week after the shipment. But if you need items urgently, I can ship it via EMS. It usually takes 3~5 working days. In this case, you should pay additional shipping cost. If you really concerned about your package, I recommend EMS shipping service. [Notic] 1.Please the color you see on the monitor may be slightly different from the actual colors of Goods 2.This item is handmade and for reference only, and so each one cannot be 100% identical, slight variations (about 1- 3cm) in size are to be expected. 3. If you experience any skin discomfort after using this product, please consult your doctor and discontinue use. 4.Since accessories are classified as personal hygiene products, returns or exchange is not accepted. 5.However, you may return an order and request for a refund, partially or in full, within 7 days counting from the day after the order arrives at the recipient’s address in the following circumstances, I am responsible for the shipping fee of returns. - Defective product - Incorrect product (from actual order) Please ensure that the product, packaging, accessories, free gifts, etc.) . If any items is missing or the packaging is not in the same condition, returns or exchanges may be denied. [Returns & exchanges] Refunds are only offered for defective products informed within 14 days upon After receiving the goods. Returning Goods Which are of Unsatisfactory Quality or Unfit for Purpose *** You can also return these items to us, but you will be charged for a round trip shipping fee. Item considered for exchange must be returned in “as new” condition, complete with all accessories and original packaging materials. All claims must be reported within 7 days after receipt of of item. [Additional policies] TAX Please check your local custom office for declaration details. We would not be responsible for any tax incurred.